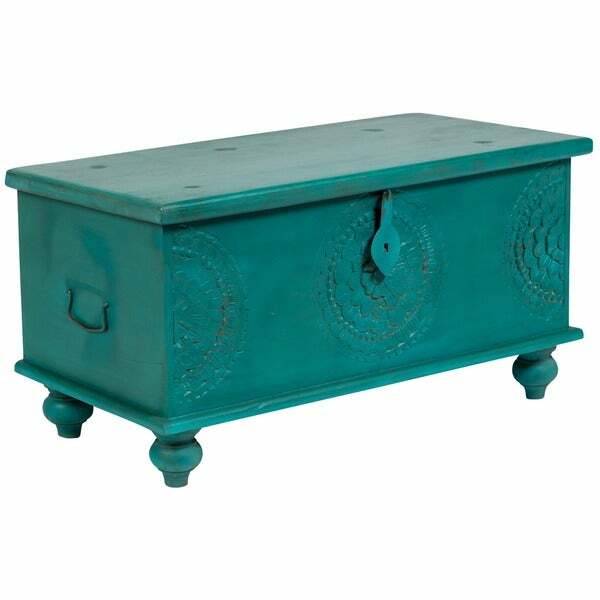 This is a beautiful and colorful trunk that is excellent for storage. It looks nice with a small glass vase filled with an assortment of faux tulips. 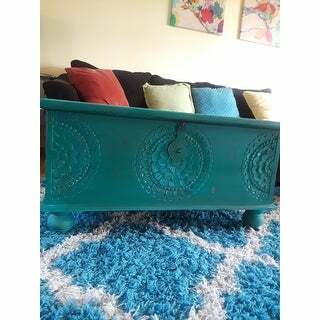 Hand-carved in India by expert artisans, this ornate and vibrant trunk coffee table lends a chic touch of color to any room. Perfect for use as a small coffee table or a fun decorative storage piece in bedrooms or halls, this one-of-a-kind piece carries the natural imperfections of artisanal craftsmanship. While variations in the finish will occur, this extraordinary piece is handmade from solid wood for an accent that's as long-lasting and fresh as it is timeless and unique. Launched in 2006, Porter International Designs was founded by a husband and wife team based in Portland, Oregon. Together they travel the world working with talented crafts people to design unique, quality furniture. Porter believes furniture should look great and feel great, so we put extra care into making sure each piece is crafted for optimum comfort. In a world of mass-produced products, we create timeless pieces you wont find everywhere else. Porter believes everyone should have well designed, quality furniture that fits your lifestyle and makes your house a home. This chest is the treasure! 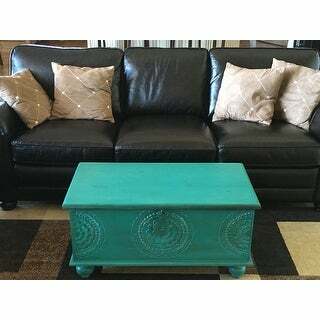 I ordered this as my coffee table and absolutely love it. It adds so much character to my living room. Visitors constantly give me compliments on this piece. Its real wood and very sturdy. The varnished finish on the inside is beautiful as well as the detailed engraved woodwork on the exterior. 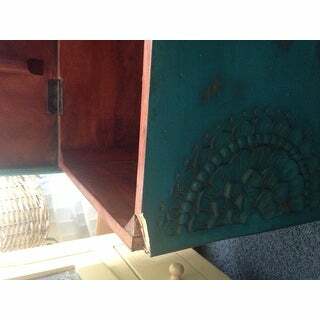 The color is darker than pictured, it's truly a teal color with some brown rubbed all over giving it an antique look. Stunning and well made. This is gorgeous! I was looking for a colorful and interesting piece to use as a coffee table. This was a great choice. I have had many compliments on it. The color is outstanding. Great care was taken in the shipping packaging to prevent damage. I love for storing seasonal items as well. The quality and craftsmanship is outstanding. Great trunk for a fantastic price! I just received this trunk and I LOVE IT!! The color isn't quite as fluorescent as in the picture - it's more of a green teal than blue, but that actually works quite well for my apartment. It arrived in excellent condition, and is very well made. I even love the interior smell; it's like having a cedar trunk, but with a slightly different scent. My sheets and towels are now going to smell great! So happy I made the choice to order this chest! I was hesitant not being able to inspect the craftsmanship and sturdiness, but oh it was so worth every penny! Beautiful design, well made, perfect size! Love it! This piece is amazing. The color is great. Lost of storage space. Makes a great coffee table also. Well built and worth the price. Would definitely recommend. This piece is an absolute stunner!!! It arrived quickly and was meticulously packaged. Its construction is solid and the craftsmanship is beautiful. The storage is great and the color is incredibly vibrant. Such a beautiful addition to our family room. I couldn't be happier. If your contemplating buying it, just go for it!!! Well worth the money!!! This product is very true to the color/picture and is a versatile piece of furniture. Still deciding where to put it, works in almost any room! 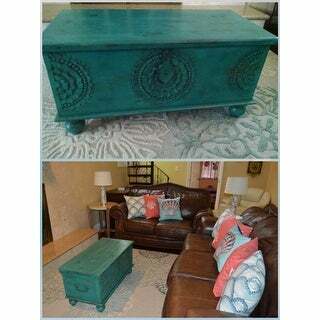 This trunk is a perfect accent piece to any room. The color is gorgeous and the detail of the woodwork is amazing. It is definitely worth the price tag. This trunk is a great coffee table. Definitely a focus piece in a drab apartment. It's beautiful and I got it at a steal of a price too! I'm in love with it. This is a stunning vintage piece that goes exceptionally well with our vintage distressed sofa. I would highly recommend this coffee table to anyone seeking a vintage hand crafted piece for their living room. I’m very happy with our purchase and would highly recommend! Everyone asks if it's an antique, or handmade. Lots of storage, too. The color is slightly less bright than the photo....and is absolutely gorgeous! Very well made and sturdy. Fantastic purchase! Really a beautiful piece. Not sure why I bought it, but it works anywhere I put it. The stain does leach and will come off any time you wipe it clean, so make sure this isn't near a white sofa, or sat on with your nice new white capris. Very nice, however paint chips easily. Gorgeous! A little greener than expected but beautiful vibrant color and quality construction. It is a large, study piece and definitely holds a lot. Beautiful color and incredibly sturdy. I’ve had it for 2 years now (used as a coffee table in my old, smaller apartment and now as a blanket holder in my bedroom). Would highly recommend! "What is the maximum weight capacity for a person to sit on this? Thanks"
Hello - This piece is not designed as seating. We would not recommend placing more than 80 lbs on the lid of the trunk. "Can you tell me: Is the height listed total height, including feet?" The listed hight is total and does include the feet. "Could anyone tell me what's involved in the assembly of this item? Any information would be greatly appreciated! " "Why are there different prices on each different color?" Prices can vary depending on, but not limited to, the types of dyes used and the unique hand-carving nature. Additionally, sale prices may reflect some sort of difference. For more on prices and changes: (https://help.overstock.com/app/answers/detail/a_id/48). My living room is mainly neutral and minimalistic. This is the perfect accent piece to add some bright, bohemian vibes to my space.